How Much Can Weight Fluctuate from Morning to Night? Throughout the day your body weight can fluctuate from 2 to 4 lbs. Generally, you weigh less in the morning than in the evening. This is due to the things you consume during the day and the various functions of your body while you sleep. 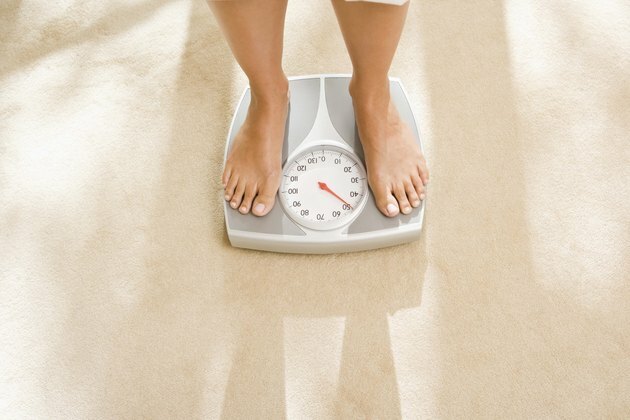 Boost your confidence by hopping on the scale when you first wake up, but lose weight overall through a healthy lifestyle. During sleep, your body processes food and drinks from the day before. Everything you consume is broken down and eliminated through respiration, perspiration or urination. Up to 80 percent of nighttime weight loss is from water, not including urine or feces. Exercising during the day and lowering your body mass index, or BMI, also promote weight loss because they increase short-wave sleep, which increases the calories you burn while sleeping. The water in your body fluctuates from morning to night. The amount of water held depends on your activities and the things you eat and drink. Participating in strenuous activities encourages water loss through sweat, resulting in weight loss. Consuming high-sodium foods and drinks, as well as excessive carbohydrate intake, results in increased water retention and weight gain. Because your weight is in part determined by the things you put in your body, you may experience weight gain through the day as a result of heavy eating. Constipation can cause you to weigh more, while other ailments, such as the flu, can result in weight loss. Hormone fluctuations, particularly in women, also play a role in daily water retention and weight gain. Lose weight and keep it off though healthy eating and an active lifestyle. Eat a diet full of fresh fruits and vegetables, whole grains and lean protein. Drink plenty of water and set realistic goals. Taking these simple steps can put you on the path of sustainable weight loss.